This article is about the microgame from WarioWare: D.I.Y.. For the enemy that appears in the Mario franchise, see Blooper. Blooper is 9-Volt's boss microgame in WarioWare: D.I.Y. This game is designed in 8-bit form, what Super Mario Bros. looked like, with exact sprites from Super Mario Bros. 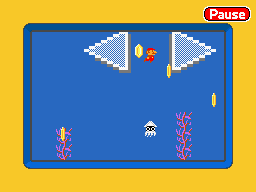 In this the game, the player is underwater controlling Mario. There is a Blooper on the stage that roams the entire stage. The player must touch the two arrows either side of Mario to move Mario around and collect the five coins scattered on the stage. If the player can collect the five coins, the game will be won. However, if the player touches the Blooper or falls offscreen, the game ends in a loss. This is the only WarioWare: D.I.Y. microgame that has no time limit. Unlike Super Mario Bros., Mario can move through the seaweed, because it is only part of the background. This page was last edited on September 4, 2018, at 14:56.